We spent two days this week helping film a television episode for “American Fly Guides” featuring Hybrid fly fishing on Greers Ferry Lake. 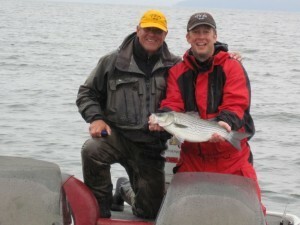 The focus of the show features a top notch fly fishing guide on a typical fly fishing trip with one of their clients. Earlier in the year the show filmed a segment with another good friend of ours, Ed Emory, on the South Fork of the Snake River in Idaho. This week the guide was Chuck Farneth and his client, Charlie, from Little Rock, Arkansas, chasing the Hybrid blitz on Greers Ferry Lake. Chuck won the first ESPN Great Outdoor Games Fly Fishing Competition and is a FFA Master Fly Casting Instructor. His Foundation, Outdoor Legacy, works with troubled young people to introduce them to the Lord through the outdoors and the sport of fly fishing. 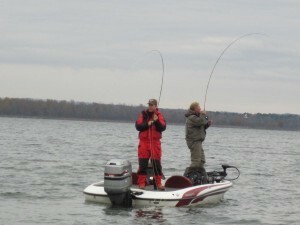 Chuck is a world class guide, casting instructor, teacher and he has been a wonderful friend to Bo for many years. Anyway, our job was to run the camera boat and try to get the video crew in the best position to film the fly fishing action. On Wednesday morning we loaded up the Empty Creel Fly Fishing battleship with an amazing array of video and audio equipment and went hunting for Hybrids. The weather was not ideal and we worked hard until well after dark and managed to hook up and film a few Hybrids on the fly. The net morning we were on the water at daylight with Chuck and a new client, Carlton Wing, who just happens to be the producer of the show and the President of Wing Media in Little Rock, Arkansas. The cool weather was perfect, water temperature of 58 degrees, cloudy skies with a light drizzle of rain and the winds were calm. We found the birds early feeding on Threadfin Shad and the Hybrids quickly followed them to the surface and the blitz was on! We got some great video of numerous double hook ups and some really nice sized Hybrids brought to the boat by both fly fishers. There were so many fish crashing the shad that Bo grabbed one of his fly rods and quickly hooked and released a few fish. Just after noon we had a show in the can. Chuck did a great job providing a lot of information on fly fishing in general which will make a very entertaining fly fishing show and everyone had a great time. The show will air on the World Fishing Television Network in the spring of next year and we will let you know when we get the exact show times. It has been a great fall season for Hybrids on Greers Ferry lake and if you want to experience the “Blitz” just contact us at Empty Creel Fly Fishing Guides and Outfitter, or Chuck Farneth at www.outdoorlegacy.com., and we will see if we can get you hooked up to a Hybrid.